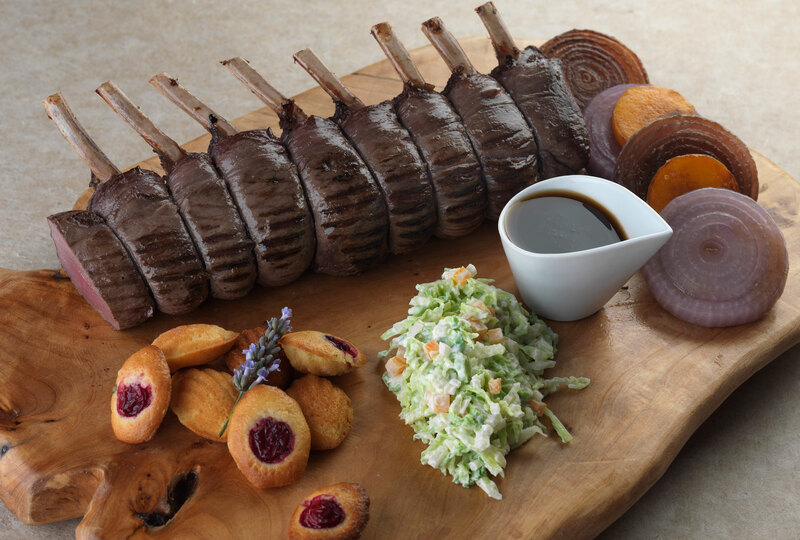 A truly festive dish, combining the rich flavor of venison with sweet roasted vegetables, creamed cabbage and soft cranberry filled Madeleines, it is guaranteed to be a showstopper. In a pan cook the mirepoix in the oil until golden in colour, about 5 minutes. Add thyme, bay leaf and crushed juniper berries. Deglaze with red wine and reduce by half. Add veal stock and gently simmer for 45 minutes. Strain through a china cap sieve, season and reserve. Preheat oven to 175˚C. Butter a mini-Madeleine mold using soft butter. Sieve flour and baking powder into a bowl. Beat eggs and add to flour and baking powder. Pour in melted butter and lavender oil and whisk to make a batter. Incorporate the peppercorns and transfer mixture into piping bag. Pipe batter into mold and arrange cranberries on top. Sprinkle with Maldon sea salt. Bake until golden, about 7 minutes. Allow to cool and reserve. Preheat oven to 175˚C. Cut red onions in half. Peel and slice butternut squash into discs. In a pan over a high heat add the vegetable oil, then onions face down and the discs of butternut squash. Cook for 3 minutes or until coloured. Add butter, thyme and whole garlic clove. Season and bake in the same oven as the Madeleines transfer to oven until soft, about 5 minutes. In a pan, heat the vegetable oil over a low heat. Season venison loin and place in the pan, gently colouring all sides. Transfer to oven and cook for 5 minutes. Remove from oven turn the loin over and return to oven for a further 5 minutes. Remove from oven and add butter. Gently baste meat with butter then rest for 10 minutes. Discard outer dark green leaves of cabbage, chop into quarters and remove and discard core. Cut the remaining leaves into julienne (5 cm long by 1 mm thick). Cut the carrots into macedoine (5 mm square). In a pan sweat the carrots in butter, add bay leaves and cook until the carrots are tender, about 3 minutes. Add julienne of cabbage and sweat for a further 2 to 3 minutes until cabbage has wilted. Add cream and reduce by half, add lemon juice, season and reserve. Warm red onion, butternut squash and madeleines in the oven for 2 minutes. Heat through the red wine jus and creamed Savoy cabbage. Slice venison loin into 18 equal sized pieces and arrange on warmed plates. Arrange onion and butternut squash discs, 2 or 3 cranberry madeleines and add cabbage. Finish with red wine jus and lavender flower (optional).